Money in the Garage: Jack-pot! It was a Saturday morning with a threat of rain in the air. (Better for you as a buyer, rain keeps the competition home) I walked up to a garage sale and immediately took notice of a huge beautiful framed print of Jack Nicklaus. Jack was portrayed casually leaning on a fence at Pebble Beach, gazing off into the distance. The framed print was resting in a shipping box, still sealed in a protective plastic wrapper. From what I could see through the plastic, it came complete with all the artist's papers authenticating the print. The frame's dimensions were huge, measuring four feet high and three feet wide. The print was a wonder to behold, it belonged in one of those "members only" golf clubhouses, right above a stone fireplace. The price tag on the plastic wrapper read $50 dollars, a price that even a mini-golf guy like me could afford. Not believing what I was seeing, I asked the seller what the background was on this work of art. (Always a good practice for when you re-sell it) The seller was a young, cocky guy who reminded me of Arie on "Entourage". He proudly went into a long story, bragging how he had won the print at a fancy corporate golf tournament. His insane reason for selling this beautiful work of art? He was a Tiger Woods fan and "not into" Jack Nicklaus! 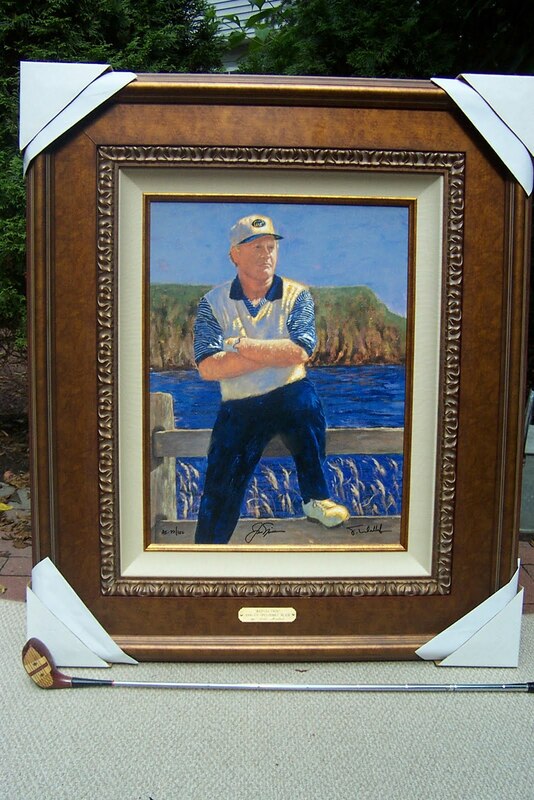 (This was before Tiger was chased down his driveway by his wife) Why any golf fan would sell a beautiful framed print of Jack is beyond me. Seriously, who doesn't like the Golden Bear? This seller's hero worship of Tiger was impairing his judgement but that was fine and dandy to me. I quickly paid him fifty bucks and headed home with Jack. Once I was home the real fun began. Part of what makes this hobby interesting and exciting is doing Internet detective work on stuff you buy. The more information you can gather on an item, the better the chances of realizing a higher selling price. In the case of my masterpiece, I took a close look at the bottom of the print. I discovered the print was definitely the real deal! It was signed and numbered by the actual artist...very awesome! I then looked at the center bottom of the print-there was a signature there as well. I peered in at it closely. My mouth dropped in disbelief...was it...could it be...is it possible?! You betcha...the Golden Bear had also signed the print too! I not only had a beautiful print, but I had Jack Nicklaus' actual autograph on it ! Slot machine bells went off in my head! DING-DING-DING-DING....JACK-POT! After a celebratory dance around the kitchen table, I caught my breath and jumped back on the Internet. To make certain this was the genuine article I went to the artist’s website. There I discovered a photo of Jack and the artist proudly standing next to the original painting! I feverishly searched for a price on the print. My draw dropped again when I discovered the same exact signed print was listed for $2000 on the artist's own web site! With this happy discovery, I got busy putting together an auction for my work of art. I took multiple pictures of the print outside in the natural light. I then posted Jack with a starting bid of $1000. Although a good price compared to the artist's website, I think buyer's are reluctant spend that kind of money on something they can't personally examine and verify. So it sat on eBay for a few weeks. After lowering the price, I ended up selling it during Christmas to two kids who bought it for their Dad. They paid me $730 for the print! I am sure if I wanted to stick it out I could have sold it for more, but I was pleased as punch with a profit of $680 big ones. The buyers got an awesome gift for their Dad and I made some big money...everybody was happy! Like I said, it's not always easy pulling myself out of bed every Saturday morning. But my "Jack" mantra always gets my juices flowing. Your "Jack" find is waiting out there for you too. Say it with me ...Jack, Jack, Jack. Now get out there! Thanks for another great post. Those kind of scores are great motivation to keep up the hunt. In fact, I believe there are many or even bigger scores out there just waiting to be found. Thanks Bill, same to you. It's the thrill of the hunt that gets us out there ! FYI, it's Jack Nicklaus, not Nicholas. Awesome score! Money in the Library ! eBay buyers love Disney !